Click image above to receive a $ 10.00 discount. The Stockbridge Sportsmen's Club, Inc. is a proud affiliate of the National Rifle Association. Click here to visit the official NRA web site. Since 1871 the NRA has been the world's foremost firearms safety training organization and guardian of your Second Ammendment rights. Club Members and visitors to this site can join, renew or give a membership at a discounted price. Join Now. 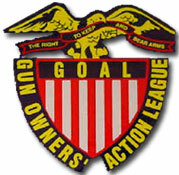 The Stockbridge Sportsmen's Club, Inc. is a proud affiliate of the Gun Owners' Action League. Click here to vist the official GOAL web site, or click here to download a membership application (PDF).